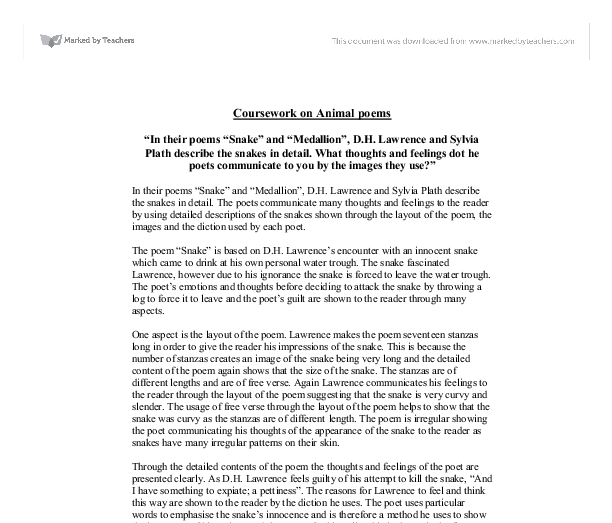 Coursework on Animal poems "In their poems "Snake" and "Medallion", D.H. Lawrence and Sylvia Plath describe the snakes in detail. What thoughts and feelings dot he poets communicate to you by the images they use?" 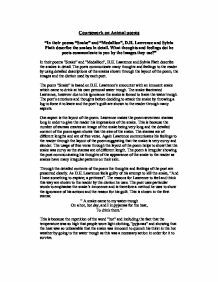 In their poems "Snake" and "Medallion", D.H. Lawrence and Sylvia Plath describe the snakes in detail. The poets communicate many thoughts and feelings to the reader by using detailed descriptions of the snakes shown through the layout of the poem, the images and the diction used by each poet. The poem "Snake" is based on D.H. Lawrence's encounter with an innocent snake which came to drink at his own personal water trough. The snake fascinated Lawrence, however due to his ignorance the snake is forced to leave the water trough. The poet's emotions and thoughts before deciding to attack the snake by throwing a log to force it to leave and the poet's guilt are shown to the reader through many aspects. One aspect is the layout of the poem. Lawrence makes the poem seventeen stanzas long in order to give the reader his impressions of the snake. This is because the number of stanzas creates an image of the snake being very long and the detailed content of the poem again shows that the size of the snake. The stanzas are of different lengths and are of free verse. ...read more. Therefore as the poem is written after the incident, the poet communicates his thoughts and feelings that the snake should have been treated equally as he compares it to a person. He also gives an identity to the snake on occasions to emphasise how wrong his actions were and his guilt for doing what he did. By giving the snake an identity communicates to the reader that the fact that the poet tried to murder a human which is the reason for his guilt. D.H. Lawrence also communicates his feelings and thoughts through he image he presents the reader with. Even by addressing the snake as a human being the poet still gives us a clear image of the snake. He includes body parts which a snake and human being both possess which suggests that the poet saw the snake as a being that was stereotyped. The image which D.H. Lawrence presents us with contradicts the voice of his education, "He must be killed", which has taught him to hate and kill snakes. However the snake is also said to be beautiful, "Being earth-brown, earth-golden from the burning bowels of the earth", this shows that the snake is beautiful as the poet uses alliteration. It also gives the image of the snake being long as colours mentioned created the patterns on the snake's skin. D.H. ...read more. By comparing the snake to a medallion, Sylvia Plath is suggesting that the snake is a rare creature as medallions are difficult to find. She shows the snake being of a unique kind, "going under the chainmail", this gives the image that the snake's skin is separated like under laid rugs. The poet's thoughts and feelings are shown through the layout of the poem. This is because the poem the poem can be divided into two sections. The first four stanzas including the first line of the fifth stanza gives a description of the snake's beauty in majority to the rest of the poem. Through the layout Sylvia Plath is communicating that although the snake was beautiful, it has now lost its beauty as it starts to decompose, "the way the sun ruins a trout", by comparing the snake to a trout. Plath communicates her thoughts and feelings towards the snake clearly by the content and diction she uses. " Knifelike, he was chaste enough, pure death's metal. The yardman's flung brick perfected his laugh", this is because she clearly shows her thoughts, as she believes that the brick that hit the snake made it look as if it was laughing. As she does not include research about why the snake was killed which communicates to us her thoughts and feelings that the snake was therefore wrongly killed. As describing the snake to be dead and having maggots in the snake's stomach suggests that a creature which once had beauty was destroyed for the wrong reason. ...read more. This student written piece of work is one of many that can be found in our GCSE DH Lawrence section. 'Discovery, like birds that steal and flee.' The boys are like birds who steal and flee with the teachers knowledge, but the teacher is happy and willing to let the boys steal his knowledge. The teacher is generous and willing to help the boys in Best of School, but in Last Lesson the teacher is stubborn and gives up easily. The poet describes every detail, "The snake forked tongue" is a very lively description.The snake even "mused a moment" , we feel we are in a presence of a human being and not a dangerous or deadly snake. They have a gun. We have no gun." The fear towards man is reinforced by the fact that they have guns. The situation could be dangerous, but there's an uncertainty about what to do. The use of bold statements is used to make the reality of the situation more apparent. It is almost as if he is saying that this is the way things should be (pleasant and nice) but they're not because of the world and also they are not allowed to be because he'll never experience getting old. As a result of this the area is not wealthy and people are trying to maintain dignity. The narrator is another clear indiction of the type of society that Lawrence is trying to portray here. There is also a sense of tradition and ritual in the story especially in the latter parts where the body is washed and prepared. A shoelace is also the same simple long bendy shape as a snake. There is grotesque imagery in this poem `I saw white maggots coil' this is referring to the maggots that the snake has possibly eaten or that are eating the rotting flesh of the dead snake. Unlike Stevens the bulter, the stable boy is more interested in himself and his feelings rather than that of the people he may or may not have just killed. Both characters's had love interests too. The stable boy is in love with Marther the millers daughter. D.H. Lawrence - A personal review. contains a portrayal of Jessie Chambers, the Miriam in the novel and called 'Muriel' in early stories. In 1914 Lawrence married Frieda von Richthofen, the two travelled extensively through several countries in the last two decades of his life. Lawrence's fourth novel, THE RAINBOW completed in 1915, was about two sisters growing up in the north of England.